Mrs. Krabusch referred there have been several explosions in Sud Est crater today. One at about 11:00, more and stronger around 16:00. About Bocca Nuova it seems something is preparing: crater ground is “blowing up”. Imminent eruption? ‘Breaking new’. Yesterday evening there was a little eruption in Sud Est crater. No witnesses but two hotel guests. We thank mr. and mrs. Krabusch for this new. Just sand but no lava river. Three new webcams offered b Etna Sci. One look at Etna Sud skiing station and should see also our hotel. It should, because today it’s foggy and I see nothing. Wonderful activity at Sud Est crater yesterday evening. 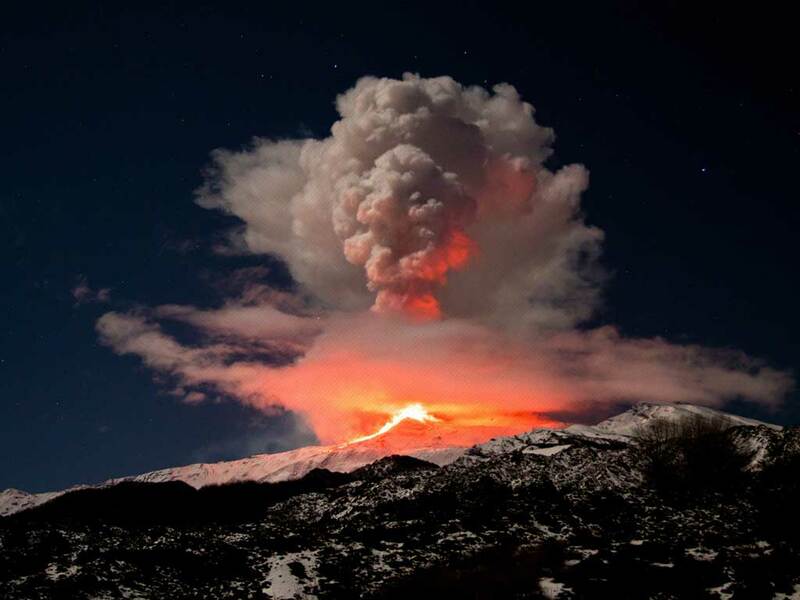 I was lucky to be on other Etna’s side, in Giarre, where eruption was visible. A long lava river and high fountains painted Etna skyline. Impressive but as usual harmless.